Or send a text message with the dollar amount and the word Cyclone (e.g. "$10 Cyclone") to (410) 220-2402. If this is your first time giving this way, you will have to fill out a short form with your billing info. After the initial setup, giving is as easy as sending a text message. Sometimes being partners means drying each other's tears, rebuilding lives and homes in the face of devastating disaster, and sharing hope when all seems lost. As Covenant Partners with the United Methodists in Zimbabwe, the Baltimore-Washington Conference is reaching out in love and action to the people whose lives were uprooted by Cyclone Idai, which swept through Southern Africa March 14. Bishop LaTrelle Easterling, episcopal leader of the Baltimore-Washington Conference and the Rev. Joseph Daniels, leader of the BWC’s Zimbabwe Partnership, encourage individuals to give and congregations to take a collection for disaster relief to assist those whose homes and lives were destroyed in the cyclone. In Crofton, Charlie Moore, a member of Community UMC who has been on many mission trips to Zimbabwe, prayed earnestly as he watched a video a friend had sent him of a white vehicle, with people inside, being swept under the mud. The fate of the passengers was uncertain. This image was compounded in a hundred other tragic incidents as the cyclone swept through the region. Moore reached out to leaders in Zimbabwe. Other leaders in Mozambique were also contacted. The devastation is heart-breaking. 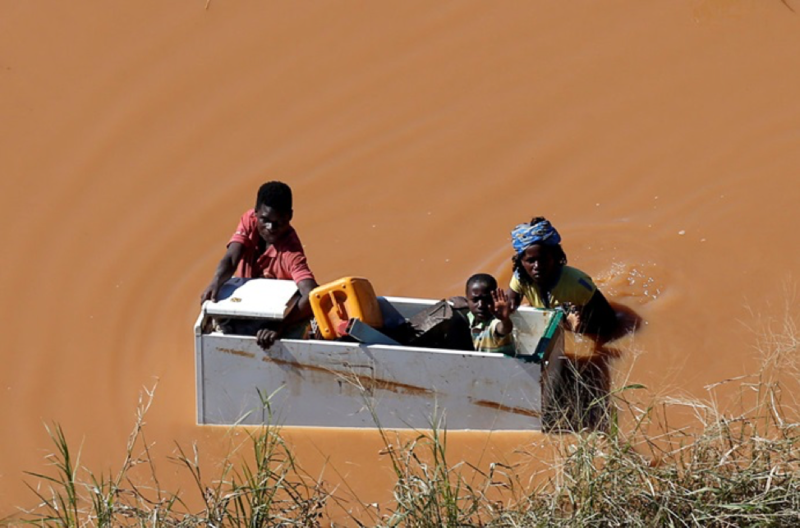 United Nations reports indicate that more than 3 million people in Mozambique, Malawi, and Zimbabwe have been affected by the torrential rains, 1.5 of them children. On April 2, reports from United Methodist communicators in the region indicated the death toll in Zimbabwe was at 415, with at least 200 still missing. In Mozambique, current figures put the death toll at 518, with 56 dead in Malawi. At least 16,000 homes have been destroyed by the storm in Zimbabwe, according to ReliefWeb. The cyclone, the United Methodists on the ground said, happened at night and people lost their homes and livelihoods. Most do not know what happened, they do not know the whereabouts or fate of other family members from their households,” said Zimbabwe Episcopal Area Bishop Eben K. Nhiwatiwa. Survivors say the roaring water, wind and rolling stones sounded like a roaring lion. The United Methodist Committee on Relief has allocated a $10,000 grant for immediate, emergency short-term funding to meet basic human needs in Zimbabwe. Mozambique and Malawi also received emergency grants. Needs include water transportation and storage for drinking, cooking, and personal hygiene, along with temporary shelter. The United Methodist Commission on Communications provided about $5,000 for solar power to enable cell phone charging in the UM mission sites in the impacted areas. This has opened up much-needed communications. 100% of all funds received through this special appeal to BWC local churches and its members will be directed to United Methodist leaders in Zimbabwe, Malawi, and Mozambique to address the most urgent needs that are being encountered. Basic Food Supplies -- cooking oil, mealy meal, salt, sugar, fish, etc. as well as cooking utensils – pots, plates, spoons, etc. The need to establish centralized “feeding points”/kitchens to provide meals for the hundreds who have totally lost their homes. Water – many generators, pipes, and pumps were damaged and need repair. Also, more wells need to be drilled. Trauma and counseling efforts are needed. There is an urgent need to provide trauma support for the children and family members who lost loved ones in this tragedy. There was considerable damage to some of the infrastructure at the United Methodist hospital at Mutambara. Repairs are needed. Longer-term, there will be a significant need to reconstruct housing that was totally destroyed. Some decisions still need to be made concerning possible relocation of many of the impacted families. Accessibility to many areas is still severely limited due to the complete destruction of bridges. This will be an ongoing recovery/rebuild effort. Gurupira reconfirmed that the short term need for clothing and blankets has been met. In light of the tragedy brought in the wake of the cyclone, BWC leaders have postponed this summer’s Pastors’ School in Zimbabwe, for which they traditionally provide funding and some instruction. Instead, funds will be channeled through the BWC’s Council on Finance and Administration to relief efforts in Africa. Eveline Chikwanah and Kudzai Chingwe, communicators for the Zimbabwe East Conference, contributed to this story. Make a contribution through the BWC using the link provided or send a check to the BWC Treasurer marked for “Cyclone Idai Relief.” Checks can be mailed to “BWC Treasurer, 11711 E. Market Place, Fulton, MD 20759.